I have to share this photo from my weekend. Many of you know Tom Massebeau, and know what a great man he is. He’s not pictured here, but I spent last weekend with Tom, who is one of my great friends and business partners. Tom has been leading a prison ministry in Florida for the past 35 years, and he deserves so much credit for the work he has done for so many. 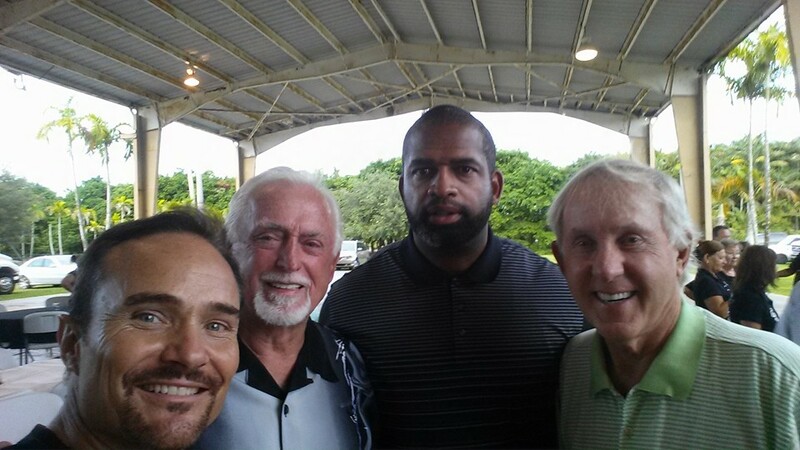 Tom brought this group in the photo together – Bruce Crevier, Jack Murphy, Santo Stephens and me – this past weekend in South Florida, where we spent two 16-hour days visiting several prisons and having the opportunity to speak with thousands of prisoners. Bruce Crevier is a world record-holding performer, and he currently holds the world record for spinning a basketball for the longest time of 22 hours and 12 minutes. He also held and broke the Guinness World Record for spinning the most basketballs at one time. He was recently featured on the finals of America’s Got Talent, and he and his wife and 12 children travel the world sharing the message of hope, including through Tom’s ministry. Jack Roland Murphy was a big-time criminal, jewel thief, murderer, as well as a championship surfer, concert violinist, movie stunt man, and hi-tower circus diver. His life story is almost unbelievable. For his crimes, he was handed two life sentences, but released after 19 years because of his dedication to helping his fellow prisoners. Since his release he has devoted his ministry to helping prisoners – he has visited over 2,000 prisons and counselled tens of thousands of prisoners over the last several decades. Santo Stephens played in the NFL with the Kansas City Chiefs, the Cincinnati Bengals, and the Jacksonville Panthers. For the past 12 years he has lead Life’s Work, LLC, and been a leadership development trainer for companies like Wal-Mart, Mass Mutual Insurance Company and Comcast. I’m so grateful to Tom for including me in this worthy program, and it has been a life changing event for me. It was one of the most intense, emotionally draining experiences of my entire life, but also one of the most rewarding and eye-opening. What a great way to spend a couple of days in Florida! I can only imagine what an impact you may have had speaking into the lives of some very needy souls. I remember an afternoon when you took time to speak via Skype to the 13 year-old baseball team that Dan was coaching. We continue hear from those boys and they remember that day and the wisdom your shared.